I feel that we should all should be looking for gifts that spread kindness year round. Because there is NO doubt – we all need a little more kindness in the world! So when it comes to gift giving, consider gifts that spread kindness. 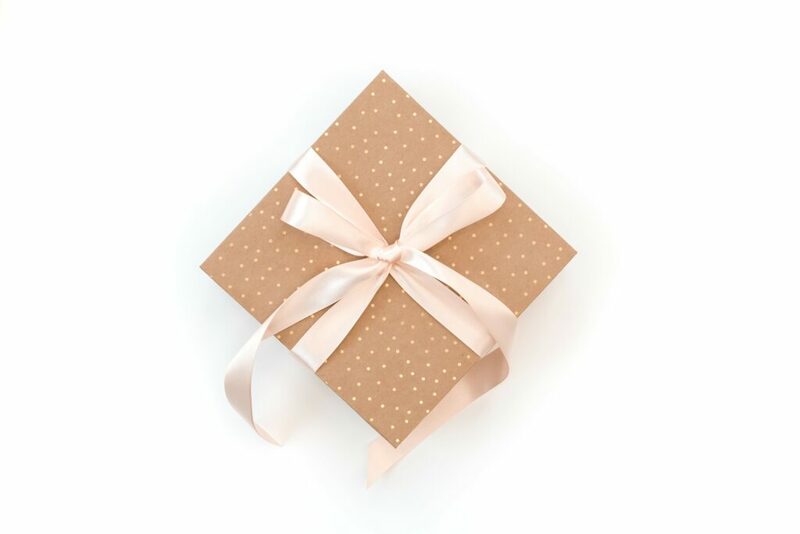 Not only will you feel great giving a gift that helps others, but the gift recipient will be cheered, as well. 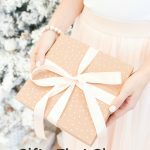 If you want gifts that make a difference and to do good in the world with your purchase, this gift guide shows you some amazing ways to spread kindness when buying presents for Christmas, birthdays, thank you gifts, housewarming gifts, or just because. 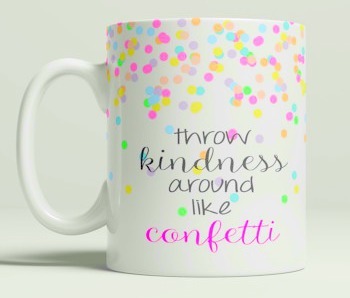 Okay, let’s start first with the idea to throw kindness around like confetti. I love the image of tiny bits of kindness flying through the air like bright, colorful confetti. It’s such a popular idea right now that there are tons of gifts to give that encourage this way of thinking. I especially love this colorful mug for coffee or tea which is made with love from a small business on Etsy. 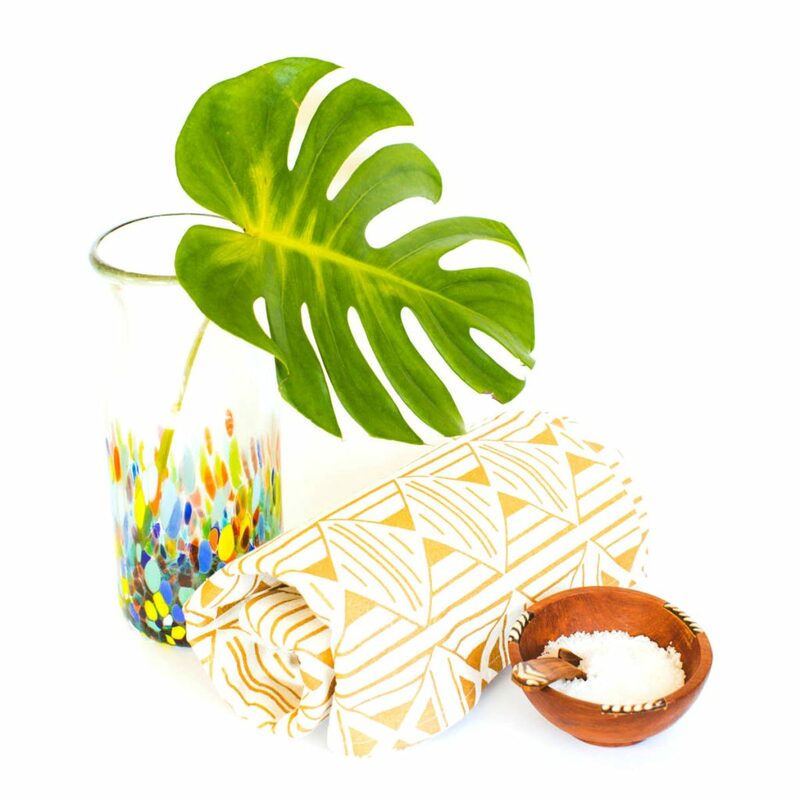 The perfect blend of gifting wonderful, useful gifts while supporting remote artisans and farmers from around the world, GlobeIn is a subscription box that you can gift for just one month, or several. Each month has a theme, and the products that come with the box are nothing short of amazing. Or you can choose a previous themed box to see exactly what is inside. 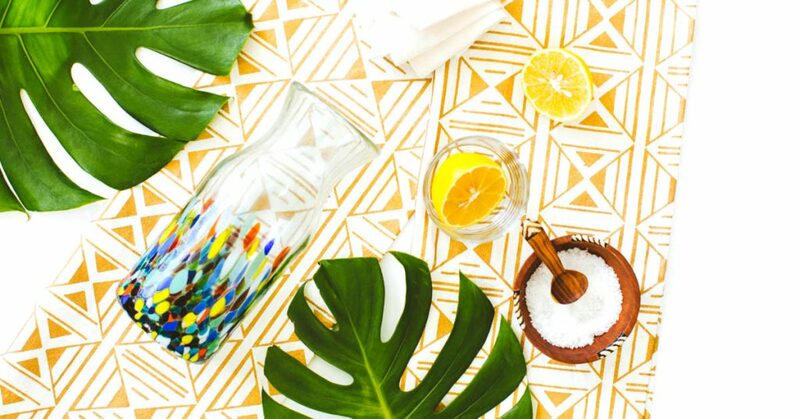 Think modern items like fashion accessories, home décor, foods and more. You simply have to see this colorful site and the gorgeous gift boxes that they offer to be hooked with this simple way of supporting those in need by purchasing their products from around the world. This beautiful book is filled with easy and smart ways to make the world a better place. 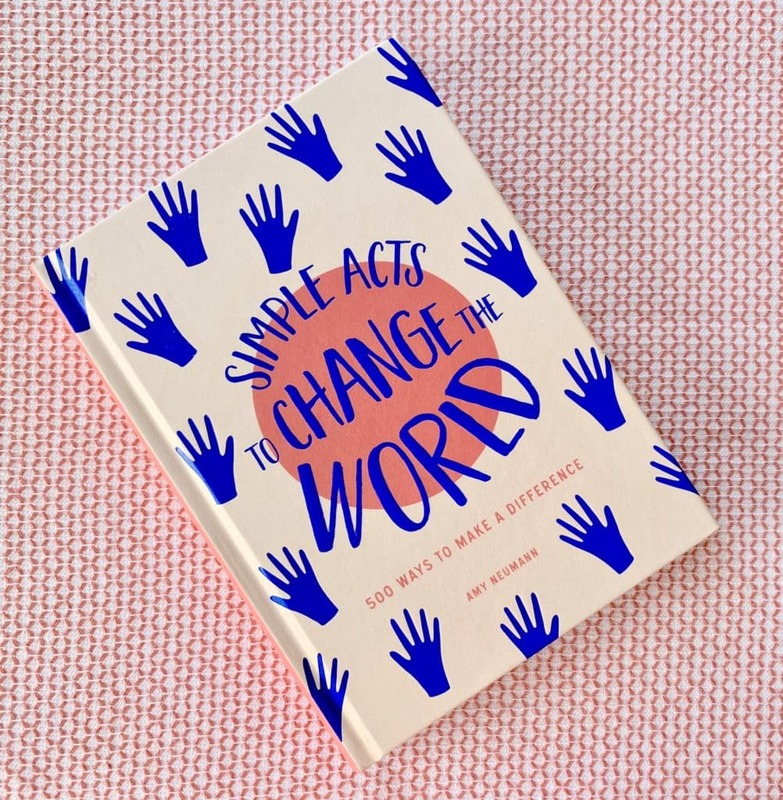 Simple Acts to Change the World is a great stocking stuffer gift. Or a perfect gift for tweens, teens and adults that want inspiration of how to spread kindness and joy. KindSpring encourages their community to do random acts of kindness. 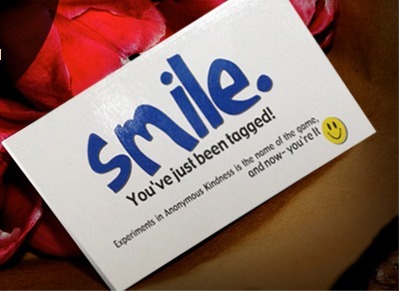 Their Smile Cards are tangible ways to spread kindness and encourage others to do the same. Request pre-printed cards in the mail (there is no set charge, you’re simply encouraged to pay what you’d like and continue paying it forward) or download Smile Cards for free instantly (they even come in many languages). Over 1,000,000 cards have been shipped so far – WOW! Perfect as stocking stuffers or small gifts. 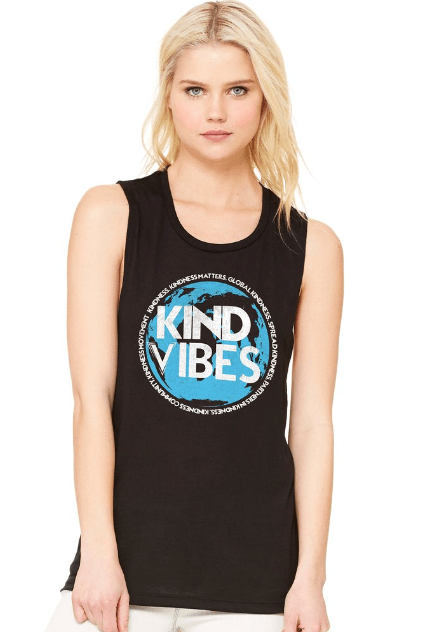 Encourage everyone that passes you to spread kindness with this Kind Vibes tee from Vibration Apparel. Each shirt not only shares positivity when it is worn, but also comes with a 20% of sales donation to Samaritan365.org, which teaches school-age children about the importance of kindness. PLUS, for every shirt purchased, one shirt is donated to a child. Many more styles are available on the website. 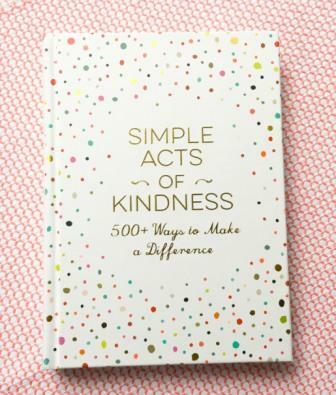 This colorfully gorgeous book is a beautiful keepsake – and a daily reminder of how to spread kindness in the world. I’ve been a fan of this non-profit that helps Ugandan women support their families ever since they first started. In fact, I own many pieces of their jewelry, and I’ve given pieces to my mom and sister, which they wear often. 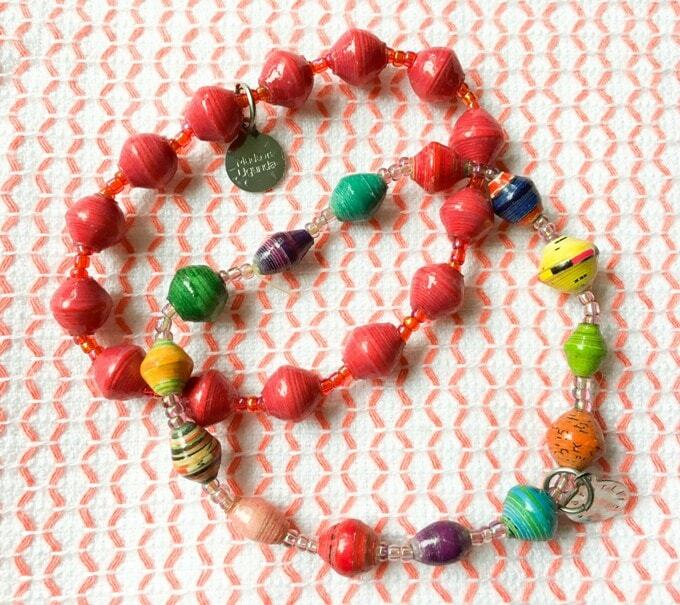 When I founded a local chapter of Dining For Women, we would throw BeadforLife parties to support the charity and I can’t tell you how much all of the women loved this event and would go crazy over the colorful jewelry. 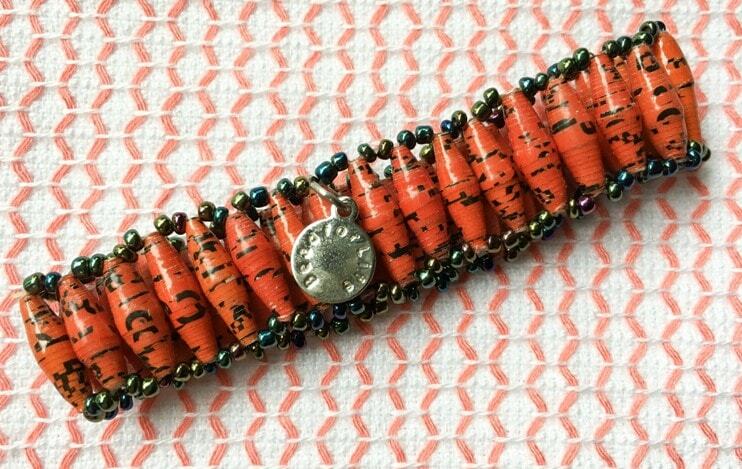 A purchase from BeadforLife is not only stylish, but also empowering to a woman in need. An ethical fashion purchase from BoshBosh directly supports girl’s education in Liberia. Buying one of these SUPER AFFORDABLE stylish wristlets, wallets, placemats or bags provides vocational education, extra-curricular activities that support education, scholarships and employment to women who need it. 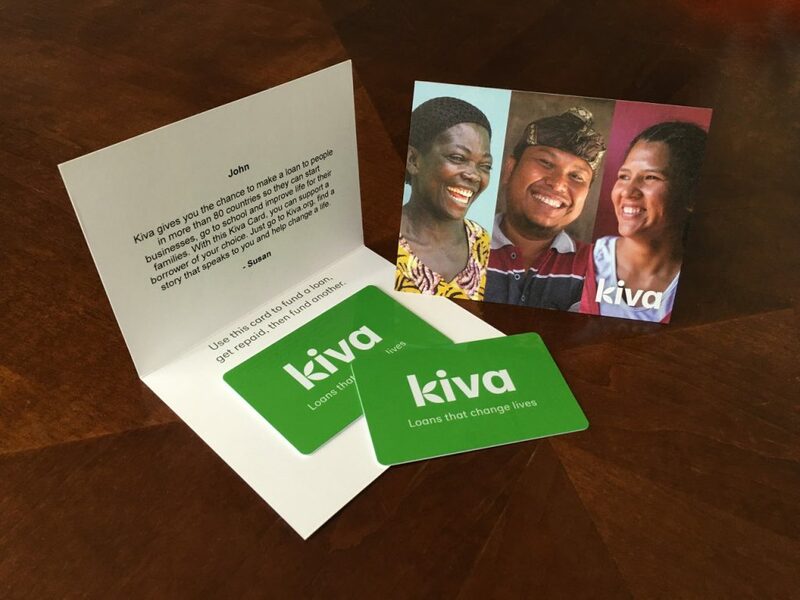 These Kiva cards are brilliant – and the gift that truly does keep on giving. Not familiar with Kiva? It’s a micro-lending site, which means that tiny amounts of money, such as $25, can help artisans, farmers and entrepreneurs around the world start a business and begin providing for their family and community. Purchase a Kiva card loaded with a value of your choosing. Give the card and your recipient can choose from hundreds of people to support around the world. Ideas include farmers, clean energy, traditional craft artisans, home-based businesses and more. In developing worlds, a small amount of money goes A LONG way! Kiva loans are repaid – with a 98% repayment rate – so when the Kiva card value has been repaid, your gift recipient can choose someone else to support. The kindness continues over and over again. Support children and families with a gift to World Vision. They have a gift catalog which lets you put all of the money towards a donation, or choose a gift that you can give which also supports the charity. The name sounds funny, but what they do to help people around the world is nothing short of spectacular. I’ve been blessed to visit Heifer International’s headquarters in Arkansas (you can, too) to see how the charity works, eat a multi-cultural meal in their café, and see a stunning building built with eco-friendly practices. 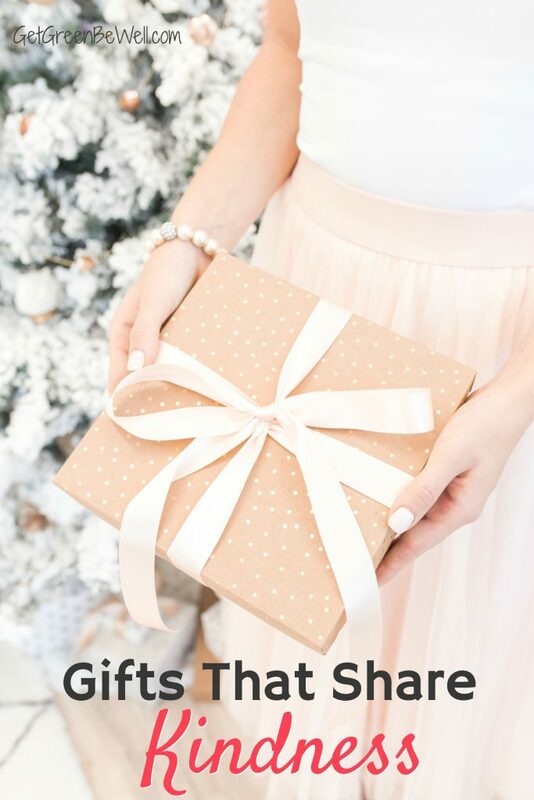 I love the way that their Gift Catalog creates “themes” for giving. Gift cards are available for gifts of kindness, too. Some of our earliest memories of finding our place in the world and knowing what kindness is might be from watching Sesame Street on PBS. This iconic children’s TV show teaches kindness and inclusion at the most tender of ages. 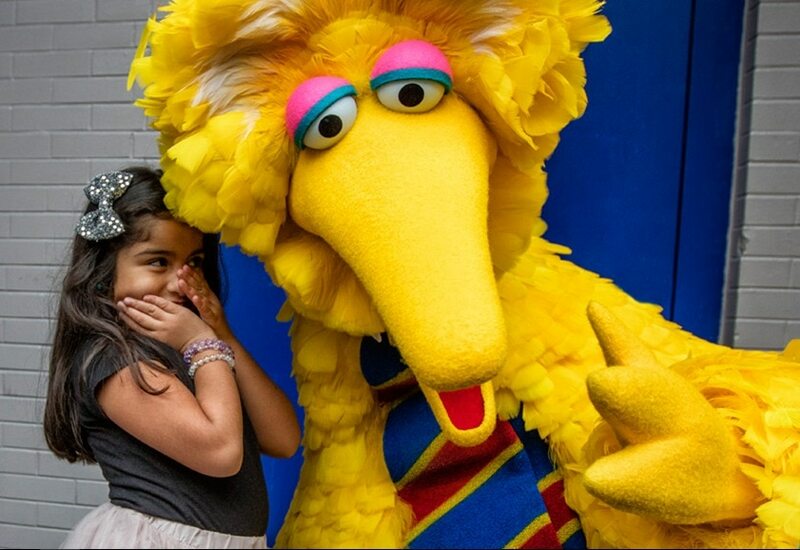 The Sesame Street Yellow Feather Fund is an initiative to bring kindness to children in need. It’s the perfect way to spread kindness for both kids and kids at heart. With donations, you’ll also receive gifts to share, including a mug, tote, pin or other gifts. (Or pair it with a cute Sesame Street plush, perfect for kids and kid’s birthday party gifts). If you’ve ever struggled with not being able to see clearly, you know how much it impacts every part of your day and your life. SOLO Eyewear uses recycled and eco-friendly materials, such as bamboo, to create stylish sunglasses. The best part is that with every purchase, they help to restore the vision of someone in need in 32 countries so far. The materials are sourced from manufacturers and communities that treat their employees fairly.